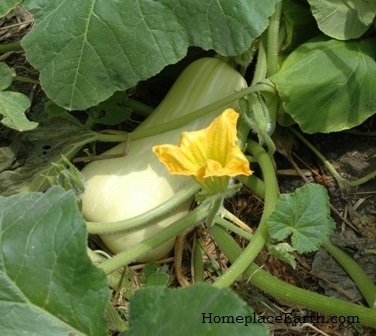 If you are new to vegetable gardening, or even if you are an experienced gardener who has moved to a new climate, it may be hard to decide when to plant. It is easy to make a list of what you want in your garden, but when to put the seeds or transplants in the ground is the conundrum. There are many things to consider, but the most important is to know the average first and last frost dates for the area you are considering. If you have been keeping temperature records, that’s great! However, not many are that diligent. Not to worry, others have that information available for you. I am sure you could find it through the weather service or your local Cooperative Extension Service, but I’ve found that a quick way to get temperature and precipitation information is through plantmaps.com. The amount of annual rainfall is important, also. Seed catalogs are a great help when deciding plant dates. At the beginning of each crop section in the catalog there is generally an information box that will guide you on planting. It might indicate that you should wait until after the last spring frost to plant a particular crop, but start the seeds about six weeks before you expect to put the transplants in the ground. 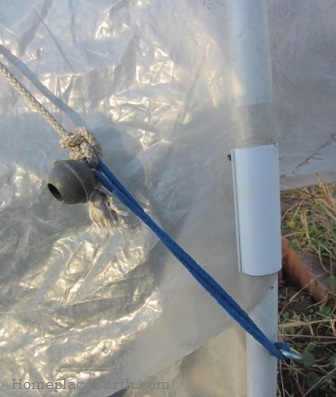 So, count back six weeks from the date you have chosen to indicate your last expected frost and you know when to start the seeds in your house or in your coldframe. At the resource page of my website you can download a free Plant / Harvest Schedule to help you with your planning. You fill in your own crops and dates. More confusing is when the planting information directs you to plant as soon as the soil can be worked. In that case I would look to what the soil temperature should be and the seed catalogs will indicate that. FYI, the soil temperature is generally about 60° around the date of your last expected frost in the spring. Find more information at my post How Important is Soil Temperature. You can use a compost thermometer or a household kitchen thermometer to take the temperature of your soil several inches deep. The catalogs I have are Southern Exposure Seed Exchange (Virginia and local to me), Sow True Seed (North Carolina), Fedco (Maine), Johnny’s (Maine), High Mowing (Vermont), Seed Savers Exchange (Iowa), Territorial (Oregon), and Bountiful Gardens (California). I like to source my seeds as close to home as possible, but sometimes there are items or varieties that are available further away that I seek out. It is good to have an overall reference book in your home library that you can consult for growing information for specific crops. 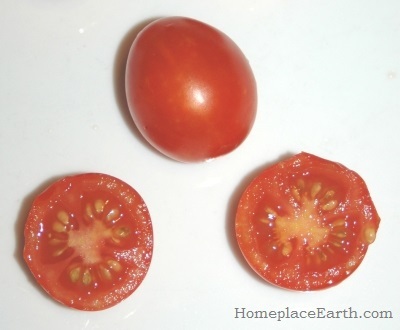 In my early gardening days I was given a copy of How to Grow Vegetables and Fruits by the Organic Method edited by J.I. Rodale and the staff at Rodale Books. I still look to that when I have questions about a crop. In fact, I wore the binding out on my first copy and now use a copy I found in good condition at a used book store. A more recent book that is a terrific reference and one I turn to, also, is Pam Dawling’s Sustainable Market Farming. Pam is growing in the mid-Atlantic region but much of her information is applicable to a wider geographical area. You can find books specific to your region. Ira Wallace, of Southern Exposure Seed Exchange, authored The Timber Press Guide to Vegetable Gardening in the Southeast. Timber Press has published growing guides for seven regions of the U.S. 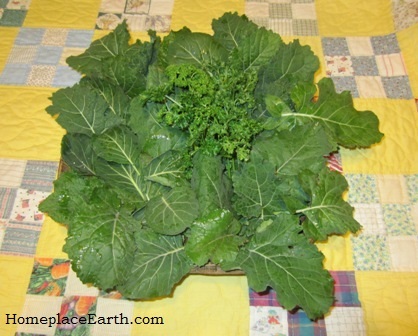 Here in Virginia, some crops, such as kale, can be planted in both the early spring and in the fall. It is too hot for these crops in mid-summer. My main crop of kale is planted in late summer for a fall and winter harvest. About March, as the days begin to warm up, overwintered kale will bolt, meaning it will send up a seed stalk that will flower and, if left alone, will produce seeds. 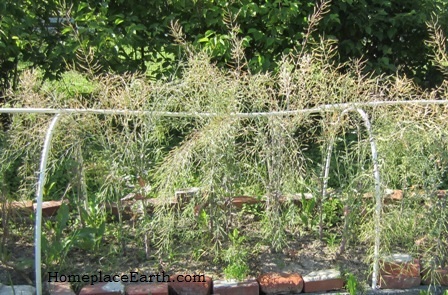 Generally you would clear out those plants to make room for spring and summer crops, unless you plan on saving seeds. 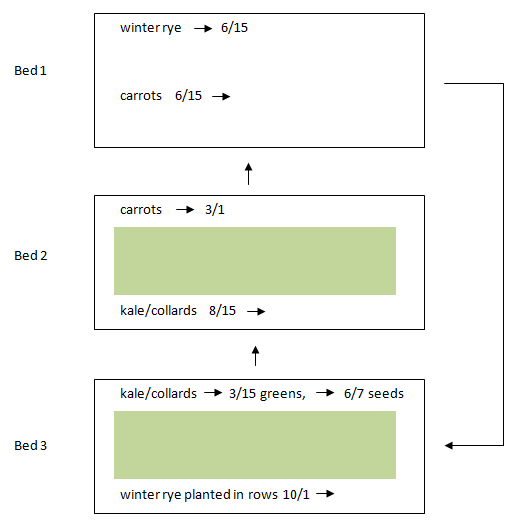 Seeds for my spring crop of kale will go into the coldframe sometime in late February, to be planted out in the garden when the seedlings are big enough—late March or early April. A friend recently asked about growing in North Dakota, specifically at the Standing Rock Indian Reservation. She will be visiting there in late July and wanted gardening information. According to plantmaps.com, the last spring frost there is the first week of May and the first fall frost is late September. I consulted The Old Farmer’s Almanac gardening calendar at http://www.almanac.com/gardening/planting-dates/states and found that when she gets there it will be time to plant lettuce, radish, spinach, and Swiss chard for a fall harvest. 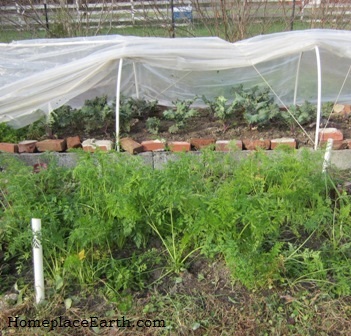 In Zone 7 we can harvest lettuce until about Christmas and kale and collards all winter under a single layer row cover. The temperature rarely dips into the single digits, and then not for long. According to plantmaps.com, at Standing Rock in Zone 4b the temperature could go as low as minus 25°. 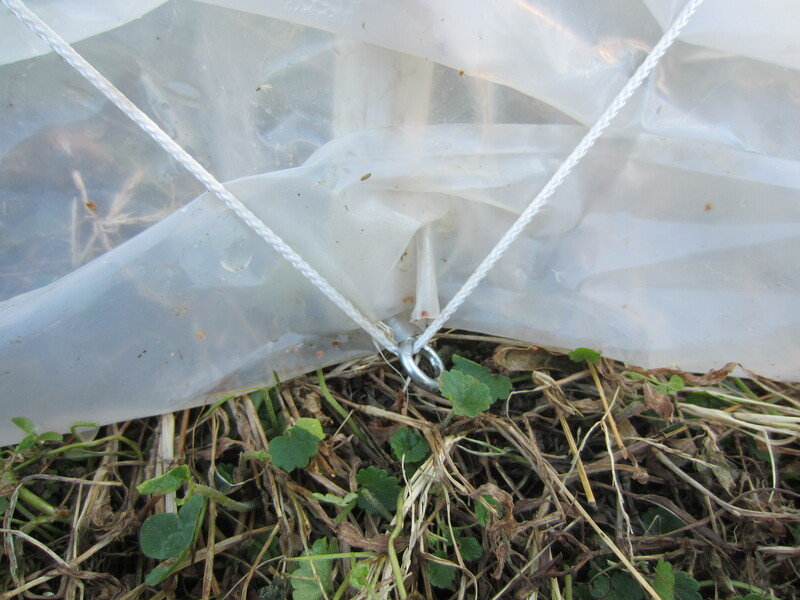 Only the most cold hardy of greens could survive, and then with multiple layers of cover. 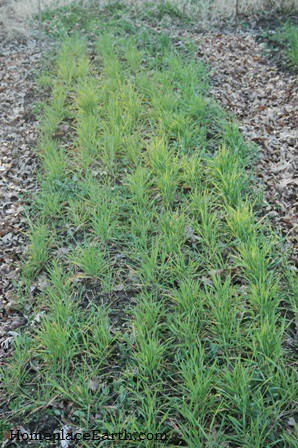 It is important to research what varieties would do best under those conditions. For extended fall planting and harvesting times under rowcovers, consult Table 16 pages 205-207, in Eliot Coleman’s Four Season Harvest, 2nd edition. It helps you determine your planting times according to your first expected fall frost and, also, if you have one or more covers over your crops. The summer nights are cooler in Standing Rock than they are here in Virginia. Besides warm nights, we have high humidity here. Our rainfall, about 44” annually, occurs fairly evenly throughout the year. Standing Rock gets only about 14.5” per year, mostly from April through October. Other places might get the bulk of their rainfall in the winter. More plays into your success in your garden than just knowing the frost dates, but that is a good place to begin to know your climate and when to plant. 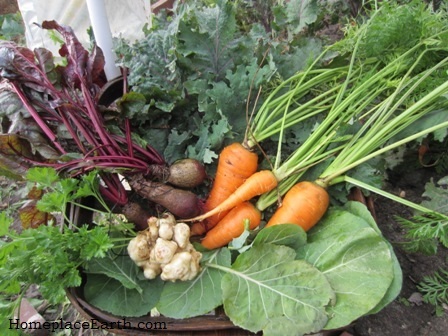 If you want to start keeping temperature and precipitation records for your garden, I have worksheets for that on the CD that comes with my DVD, Develop a Sustainable Vegetable Garden Plan. There is also a download code for these record sheets in my book, Grow a Sustainable Diet. Getting better acquainted with your garden this way will help you understand what Mother Nature is saying to you when you are there. Listen carefully. FEBRUARY 3, 1017 UPDATE: I was alerted that the map that appears on plantmaps.com is the USDA Hardiness map for 1990. The USDA updated their maps in 2012. Scroll to the bottom of that map and you will find a link to the 2012 map. There is also a link to the updated map in the right sidebar. Plantmaps.com has maps for countries other than the U.S., which should be helpful to many of my readers around the world. It is easy to talk about saving seeds and what a good thing it is to do. In fact, I wrote a whole book about that—Seed Libraries and other means of keeping seeds in the hands of the people. You will be able to read it when it becomes available in late January/early February 2015. I’ve been working on it all year and have now submitted it to New Society Publishers. In the coming months it will be going through the editing process and everything else involved in bringing a book to fruition. In Seed Libraries I give some tips about saving seeds, but it is not about the ins and outs of seed saving. Rather, it is about how to establish a community seed saving project and keep it going. I thought I’d give you a preview of the photos that will appear on one of the eight color pages in my new book. You can read all you want about when to harvest the seeds, but when it comes right down to physically doing that, I’m sure you will have some questions. 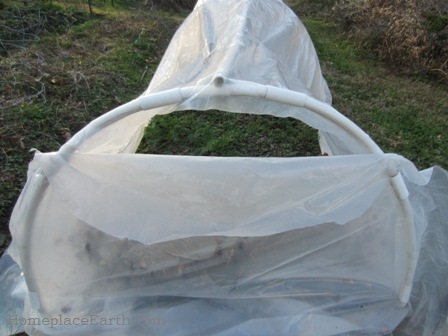 When saving seeds you need a way to separate the seeds from the chaff and you can do that using seed screens. 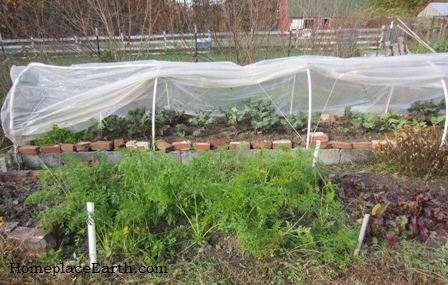 As you will see, there are seed screen options to fit all budgets. 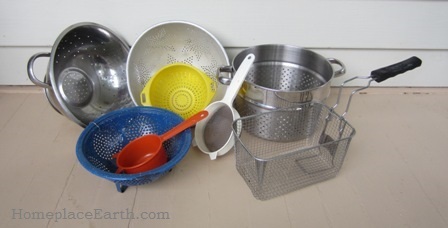 The first photo shows my collection of colanders and strainers. You probably have these items in your kitchen already. When I visit yard sales I keep an eye out for ones that might have different size holes than what I already have. These work great and the price is right. However, the holes are not always the size I want to work with. 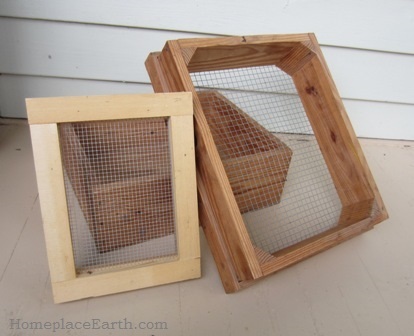 These two wood-framed screens were made with scrap wood and hardware cloth. The smaller one has ¼” holes and the larger one has ½” holes. The smaller one is borrowed from a friend. 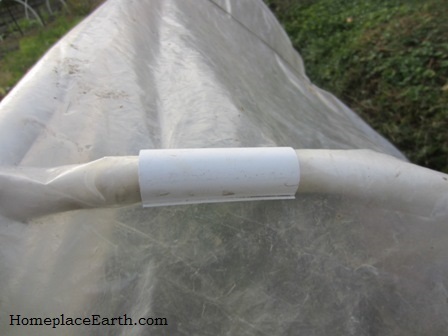 I made the larger one to facilitate working with beans and cowpeas. I can thresh the beans from the dried pods in an old pillowcase by hitting it with a piece of old broom handle. Everything gets poured out of the pillowcase onto the screen. The wood sides keep things contained so I don’t have pods and beans all over the place. When we moved to our five acre farm thirty years ago, I found an old screen like this in a shed. I made my new one to the same dimensions. I added the wooden blocks in the corners to strengthen the frame and to keep seeds from getting caught in the corners, and made a box to fit under the screen frame to catch the seeds. With half-inch holes, some chaff comes through with the beans. Chaff that is smaller than the seeds can be quickly dispelled by pouring everything through a screen that is slightly smaller than the seed, holding the seed back and letting the chaff and dust through. I usually use this system for cowpeas and you would think that the quarter-inch screen would do that job for me, however I need something just a little smaller. Some of the cowpeas pass through the quarter-inch spaces. If I was trying to sort the seeds to save the largest, that would be an advantage. 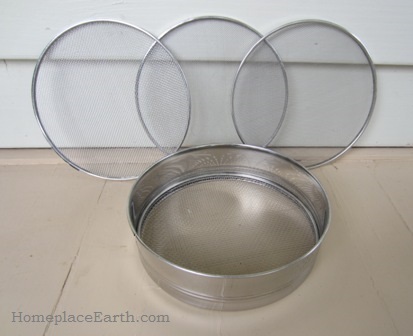 Thanks to my friend, Molly, I discovered the 4-in-one sieves that are available at Indian grocery stores. There is one stainless steel frame that is 8 ½” in diameter and four interchangeable screens—the holes in the largest are 1/8”. My interest in these screens is in working with the small seeds. 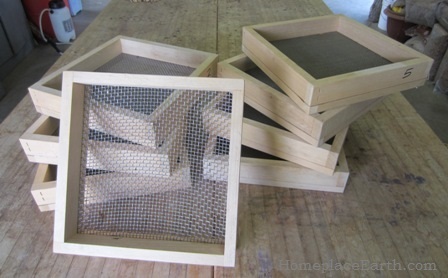 Currently I have kale seeds to thresh with these screens. The screens are lightweight, don’t take up much space, and have the size holes that I want. For home use, this does well and should last a good while, but it is not going to stand up to the abuse that the screens in the first two photos will. At a cost of less than $15, these screens are a good deal. By contrast, here is a professional set of eight screens that will take much handling for years to come. With eight different sized holes, you could surely find the size you needed. The price for these screens is about $190. With the other options available, you would have to be a serious seed saver to invest in something like this. Or maybe you just have more money than I do. These screens would be good for farms with many different people handling them and lots of seeds to thresh. My last photo is not in the book. 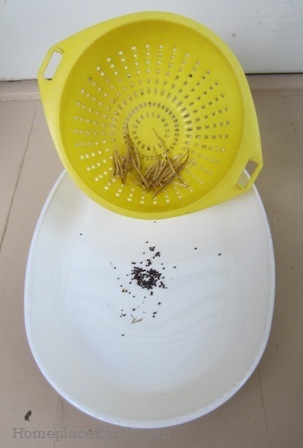 It shows threshed kale seed put through the small yellow plastic strainer, with the pods left behind in the strainer. It works just fine! I acquired this strainer when my mother was going through her cupboard to give me a few things. I asked about the strainer and she said she didn’t think I would want it because it was plastic. She was right—I avoid plastic in my kitchen, but this strainer stays with my seed saving supplies. I like it because the holes are small rectangles, rather than circles. If you are a seed saver, take a look around your kitchen before you spend money on seed cleaning screens. What you need might already be there—at least to get you started.